Journalist Whitney Webb joins us today from Chile to talk about the budding “trust industry” — the latest crusade (and gold rush) to fight fake news. A new, for-profit startup called Newsguard, aims to partner with major tech platforms, marketing firms and other institutions to mark news and information websites with color-coded flags to show consumers which ones are reliable. It is already installed as a feature of Microsoft’s mobile web browser and is running as a browser extension in some public libraries. Newsguard markets itself as a “a news literacy tool,” “a research tool” and claims that it will “tell you if a news site is reliable” with the lofty goal of “restoring trust and accountability.“ One of their founders has made the rounds in the print, online and TV media pledging to fight fake news, disinformation and Russian propaganda. 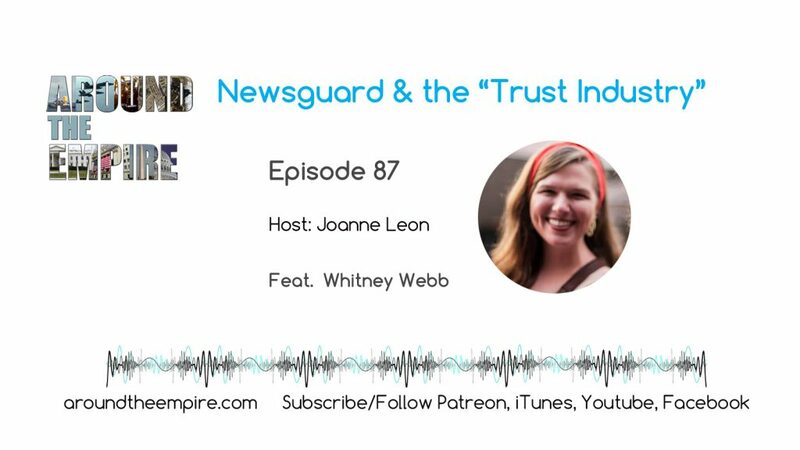 Whitney Webb did her own extensive research, fact-checking and analysis on the credibility and reliablity of Newsguard itself: its founders, financial backers, advisory board and staff and she discovered a lot of troubling facts. She also provides insightful analysis on the risk and potential outcome if Newsguard succeeds in becoming a ubiquitous, involuntary service, and some more upbeat advice on ways to deal with a scenario that threatens to blacklist genuine, independent media outlets that allow dissent and refuse to stick to the establishment-approved narratives. Whitney Webb is an American journalist and staff writer for MintPress News who has been published by and done interviews with many other independent media outlets. She currently lives with her family in southern Chile. FOLLOW Whitney on Twitter @_whitneywebb . Find her work at MintPress News. Around the Empire is independent media and we rely on the support of our listeners. You can pitch in at Patreon: patreon.com/aroundtheempire or offer one-time contributions via aroundtheempire.com. FOLLOW @aroundtheempire. Follow Joanne Leon at @joanneleon. SUBSCRIBE/FOLLOW on iTunes, iHeart, Spotify, Google Play, YouTube, Facebook. Recorded on January 26, 2019. Music by Fluorescent Grey.